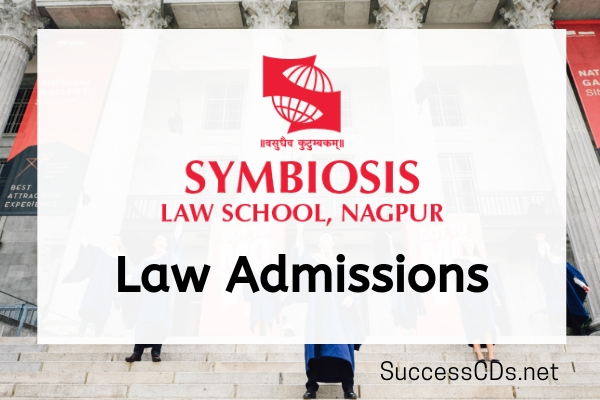 Symbiosis Law School Nagpur Integrated Law Admissions 2019 through SLET - Symbiosis Law School Nagpur invites applications for admission to BA LLB and BBA LLB Program for the session 2019-20. Separate Merit Lists for BBA. LL.B and BA. LL.B programme will be prepared and published. At the time of SLAT registration, it shall be mandatory for the candidates to clearly indicate the programme to which they wish to apply. Note: It is suggested that the candidates who have studied arts/social sciences subjects for their qualifying examination may apply for BA. LL.B programme. Similarly, those candidates who have studied commerce/accounts/mathematics/sciences may apply for BBA. LL.B programme. Further, the candidates are also free to make their own choice of section of the programme depending on their ability, interest and opportunity. Please note that these two programmes differ only in the First Degree contents (either Humanities OR Business Studies), whereas the Law courses are offered in both the programmes are the same. Graduates in both streams are eligible for diverse legal careers and opportunities in Corporate, Litigation, Civil Services, Advocacy, Judiciary, Academics, jobs in International Organizations, International Admissions and others. Symbiosis Law Admission Test shall be conducted at different centres across the India. SLAT will be an online admission test for 150 marks. Structure of test includes 150 questions for 1 mark each covering Logical Reasoning, Legal Reasoning, Analytical Reasoning, Reading Comprehension and General Knowledge. A Total time of 150 minutes shall be given to candidates to solve the questions. Candidate must pay Rs 1750/- as a SLAT registration fees. Candidate must complete the SLS, Nagpur payment of Rs. 1000/- per programme (i.e. BA LLB and BBA LLB) while filling the SLAT registration form.